The grieving family members of the 31 Afghan citizens who were kidnapped over a month ago are still waiting in despair for their loved ones to return without knowing much who took them and to where. The abducted men were on their way to the central city of Ghazni and the capital Kabul from neighbouring Iran when armed men stopped their bus in the southern Zabul province. The incident took place on a Monday night: February 23, 2015. A group of armed men who were covering their faces allowed the women and children to proceed to their destination while taking the men away from them. Most of the victims belong to the ethnic Hazara community who follow Shia Islam and often visit Iran for spiritual trips. Ever since then, the community has been at a loss as to where their men have been taken, and by whom. Thoug, no group immediately claimed responsibility, nor demanded a ransom, a deputy police chief in Zabul province has claimed the militants of the Islamic State of Iraq and Syria ISIS were behind the abductions. Ghulam Jilani Farahi told journalists the search and rescue operation was underway in the Zabul province. For over a month now, members of the Hazara community and their sympathizers in Kabul have been leaving their homes in the morning for a sit-in at protest camps in the city. The affected families have set-up at least three camps in Kabul where they come every day to share their pain and keep the issue alive. Mrs Qamar - she goes by one name like many Afghans - has been joining others in a protest camp in the city demanding the government bring back their loved ones. Qamar’s husband is among the abducted men. “He was all I had in my life. Life does not mean anything without him. If he does not come back I am going to set myself on fire,” the desperate and traumatized housewife said. Most people at in this heartrending gathering have similarly painful stories to tell. Afghanistan has been witnessing such suffering for so long that many fear the authorities might just over look the efforts to rescue the 31 abducted passengers. A young boy Naimatullah was part of the protest camp to raise voice for his missing father, the sole breadwinner of the family. Also asking the international community, especially the United Nations to help, the mourning friends and family members of the abducted men are determined to stay in the camps till their demands are met. Only at the Zar Nigar Park, the mausoleum of former Afghan King Abdul Rehman, right in front of the Presidential Palace at least a thousand men, women and children have been attending the protest camp on daily basis. Abdul Bari Salam, one of the organizer of the camp told Fair Planet they have no political or other objectives behind the movement. “We just demand safe recovery of our loved ones, that is it,” he said. Many political leaders and government officials have visited the camp in a bid to assure them of the government’s efforts. Abdul Rauf Enami, Secretary of the Wolesi Jirga (lower house of the Parliament) was one of them. On a visit this week, he assured the protesters that the government would soon ensure a safe release of the 31 men. "President Muhammad Ashraf Ghani has pledged to ensure release of the hostages within ten days and then they will be joining their families," Enaami told them. But as a protester Nesar Zafary said, the friends and family members of the abducted passengers have very little faith in their government. “They (leaders) are too busy fighting for more power and money, they just come here for political point scoring,” Zafary said. As most of the NATO-led foreign forces have left the war-torn country, security responsibilities now lay on the shoulders of the nascent Afghan security forces. Owing to the dearth of any rail network, most people in the landlocked Afghanistan rely on the often insecure road networks for inter-city transportation that has become more dangerous following the mass kidnapping in Zabul. Ensuring security on the highways remains a daunting challenge for the Afghan forces. As the Sun sets on the Himalaya Ranges, the protesters from Kabul’s Zar Nigar Park left for home with a heavy heart and a will to come back for another day of hope. 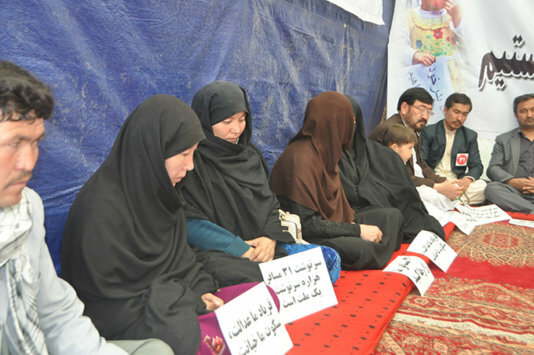 Afghans in a protest camp demanding safe release of their abducted loved-ones.